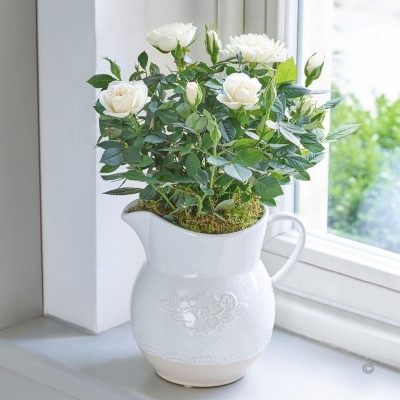 This lovely jug arrangement is sure to please. 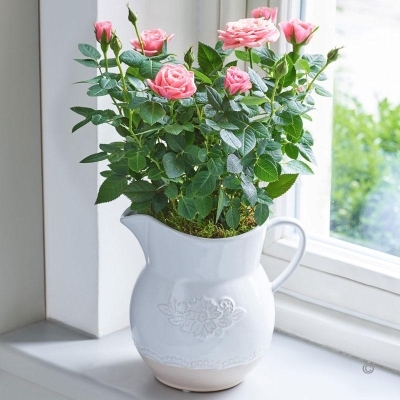 Created in Chantilly embossed ceramic jug with a rose plant, and all ready to display. Vase included. Also available in pink and white. 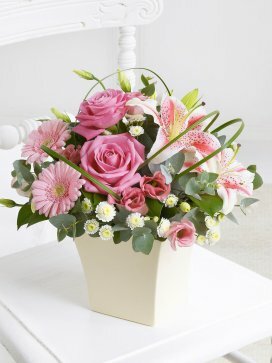 As one of our most popular gifts, this beautiful selection includes classic pink roses and fragrant oriental lilies with pink germinis and a touch of gypsophila. 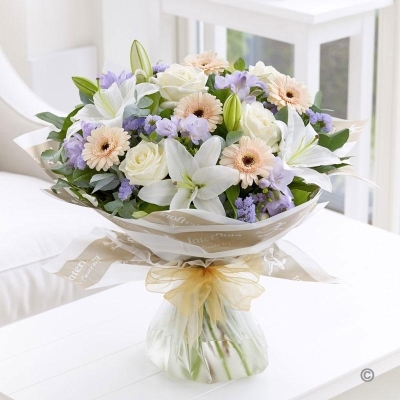 This chic and contemporary hand-tied bouquet is rich with texture and detail and the lilies add a beautiful sweet scent. The combination of pristine white flowers, expertly arranged with fresh greenery, is hard to beat for pure, elegant simplicity. 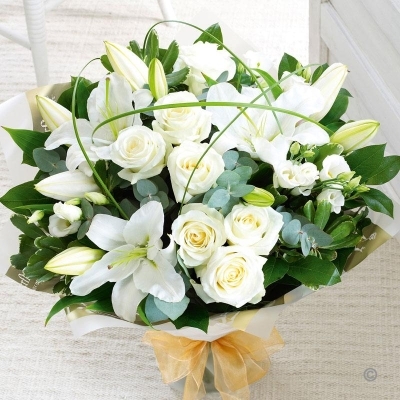 Stunning lilies and luxurious roses make this bouquet look very special, and the tiny gypsophila flowers add to the overall effect. 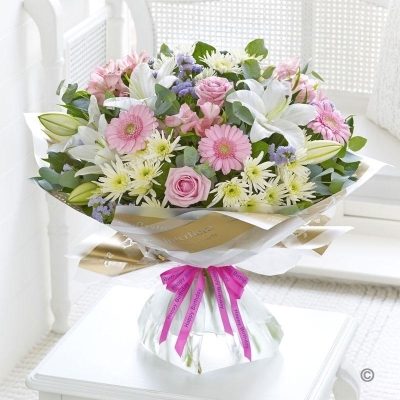 A new take on our popular favourite, the pink radiance hand-tied. It's the timeless beauty and elegant simplicity of this arrangement that makes it so special. Exquisite large headed white roses, graceful lilies and a beautiful selection of germinis and lisianthus make up this chic display, and the looped steel grass adds a contemporary twist. We've designed this vibrant gift to make impression on arrival with a burst of colour. Notice how the mix of glorious shades contrast and compliment each other perfectly. This is a dazzling display that should also prompt an equally dazzling smile of delight. 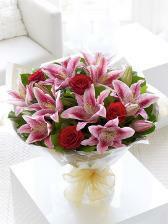 This fabulous gift showcases the full beauty of these stunning oriental lilies. 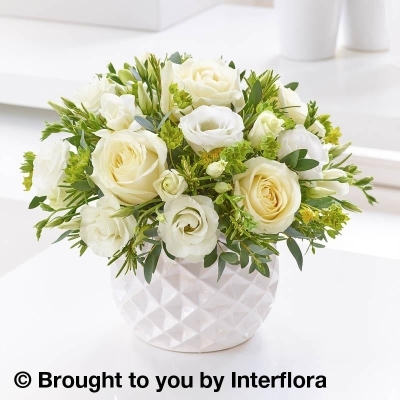 Beautifully displayed in a slim, clear crackle glass vase to really emphasis the splendour of the flowers and play of the contrast of crisp, white petals set against rich green leaves. 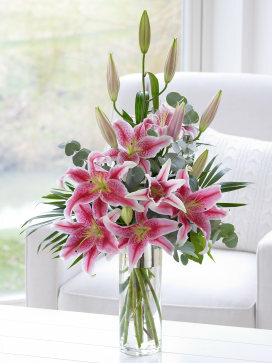 A contemporary, luxurious design and beautiful way to enjoy lilies. Someone is going to love this gift. 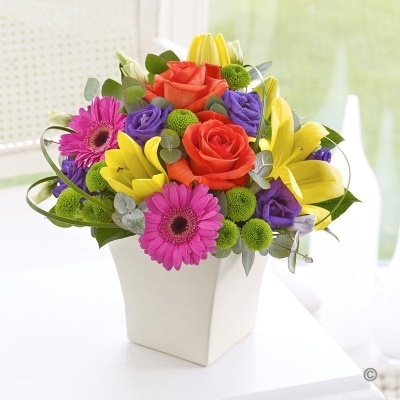 The Kaleidoscope of radiant colour ensures this striking hand-tied takes centre stage right away. 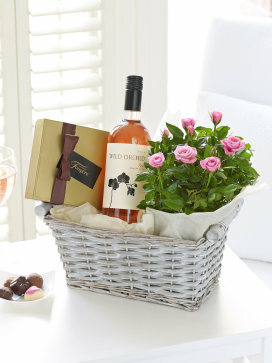 With roses, carnations, lilies and so much more, this is certainly the right choice gift to make an impression. 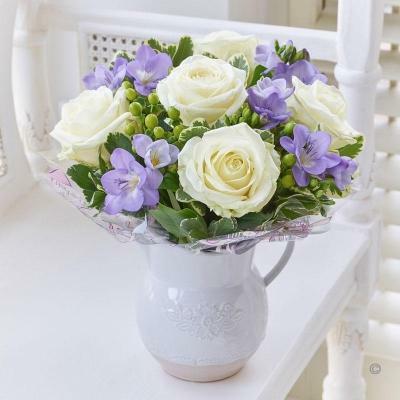 We have created this lovely Chantilly embossed jug arrangement that includes roses and freesias, this is a beautiful scented gift that will brighten up any home. This is a very elegant and contemporary hand-tied bouquet. Groups of crisp white flowers are beautifully framed by loops of steel grass. 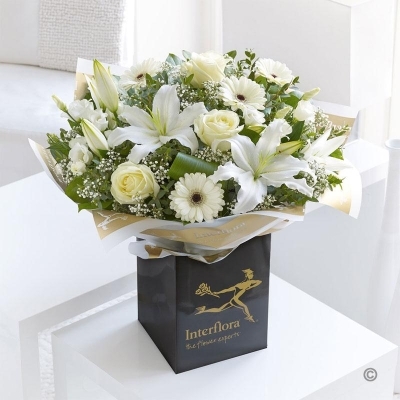 It's simple in colour but detailed in design and the lilies give a rich and sweet scent to the bouquet. 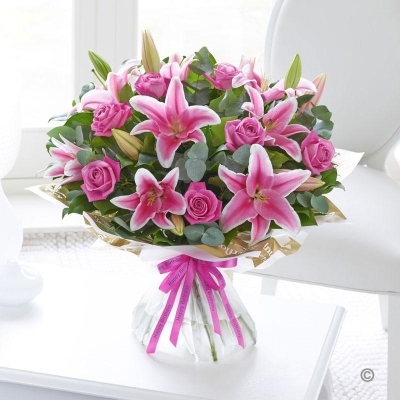 This is a truly spectacular combination of large headed pink roses and elegant oriental lilies. 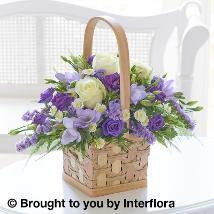 It's a popular choice too-these flowers are both firm favorites, and work so beautifully together. 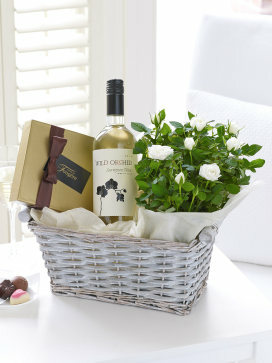 Simple, and very stylish, this hand-tied is a fabulous gift. 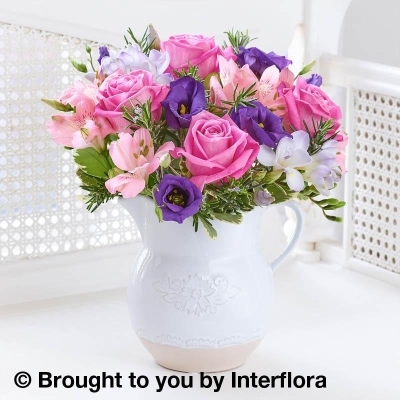 We have created this lovely white ceramic jug arrangement that includes a mix of freesias, roses and alstromeria. This gift will brighten and cheer any home. 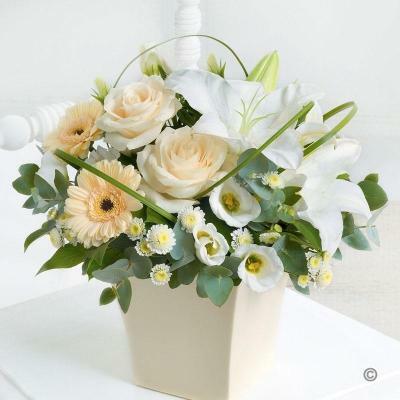 Sophistication, beauty and understated elegance: this exquisite bouquet really has it all. There is so much to savour, including the exotic beauty of lilies, the delicate scent of freesias and the softest shades of cream, peach and lilac. 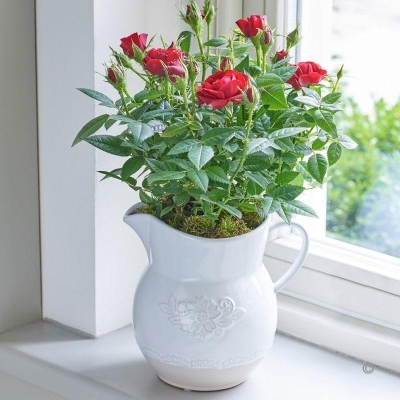 Fresh, simple and effortlessly chic, these beautiful rose plants make a pleasing gift for someone special. 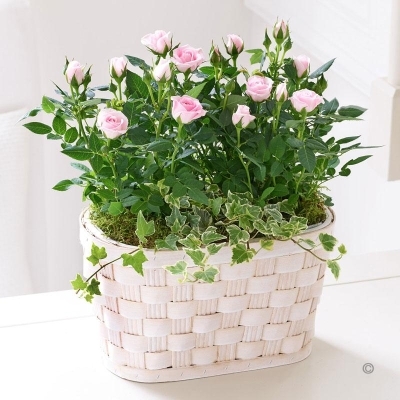 We've planted them in an attractive woven willow basket creating a charming display for a window ledge or table. This is a gift of flowers that is simply bursting with colour. 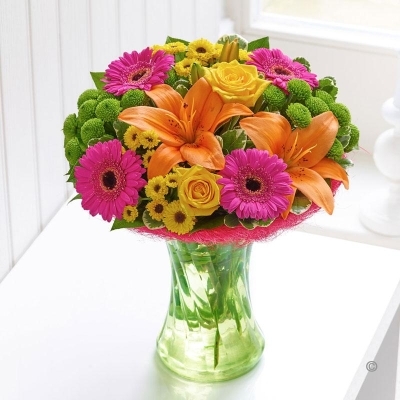 There are hot pink germini blooms, lime green chrysanthemums, a sumptuous golden rose and not forgetting the bright orange lilies with their gorgeous dark middles. With so much to enjoy, it's difficult to know what to admire first. 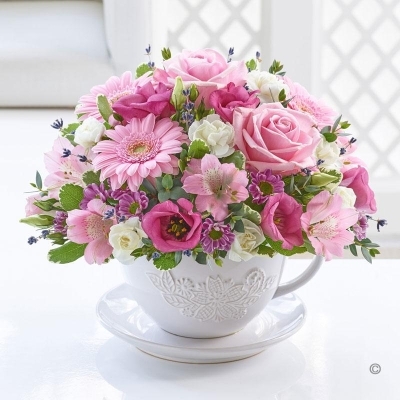 For a quirky twist on the traditional floral gift, this teacup and saucer arrangement is pretty and fun too. We've chosen a stunning array of glorious textures in shades of feminine pink and cream. A wonderful centrepiece for any room that is sure to be a talking point. 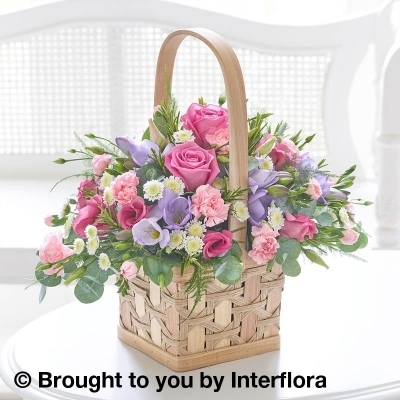 If pink is their favourite colour then this pretty display of wonderfully feminine pink and lilac flowers is sure to be their favourite too. 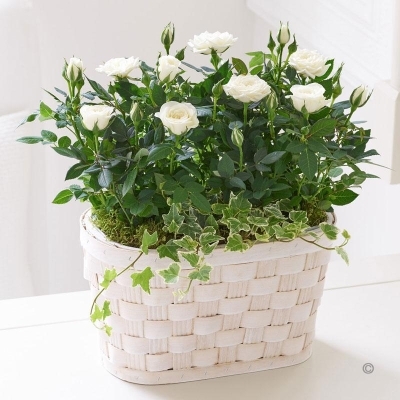 Carefully arranged in a petite wooden basket, they will discover roses, lisianthus and chrysanthemums as well as delicately scented freesia and eucalyptus cinerea. 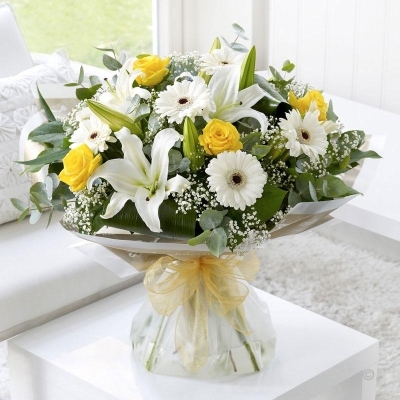 We love the way these sunshine yellow roses really light up this gorgeous hand tied. 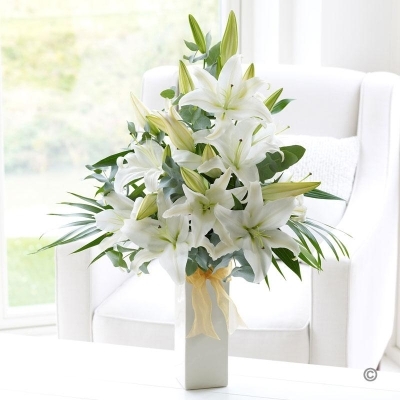 We've added an array of crisp white flowers including stunning lilies and pretty germini and interspersed them with delicate white gypsophila. 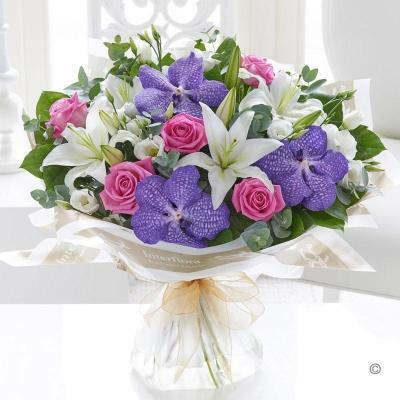 There's something very special about this hand tied bouquet of exotic flowers in striking shades of blues and pinks. The luxurious blue Vanda orchids are just heavenly, and these oriental lilies are particularly elegant. This is the ultimate in distinctive floral chic. 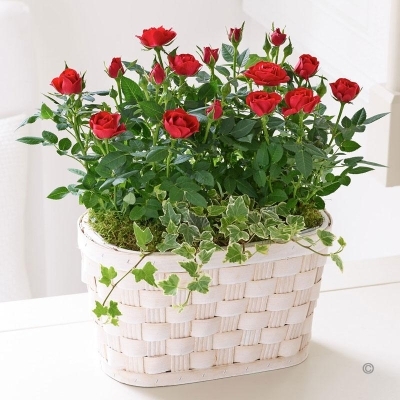 This classic rose arrangement will compliment any home. 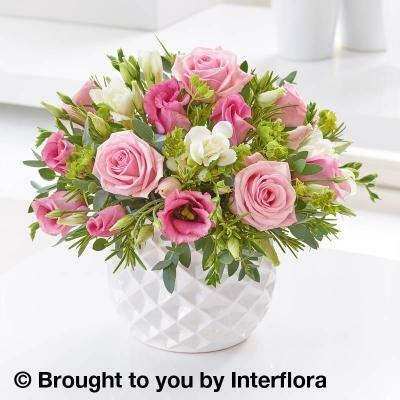 Ready to display in a ceramic geometric pot, it includes large headed roses, scented freesia and eucalyptus. Also available in vanilla cream. 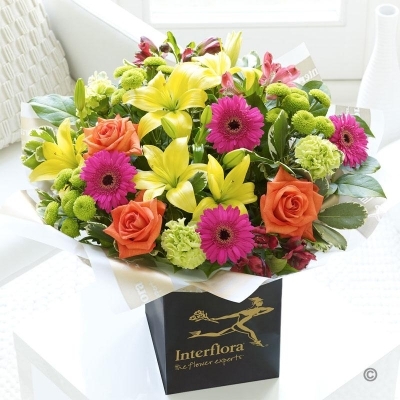 Make a statement with this sumptuous hand tied. 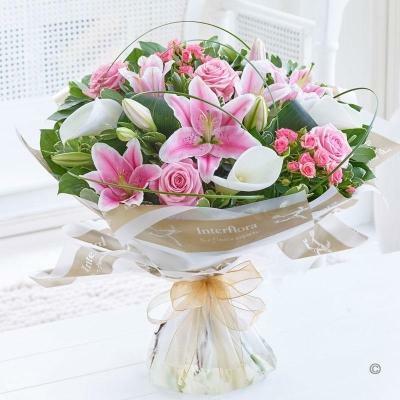 This has large pink headed roses, pink and white lilies and stunning foliage. 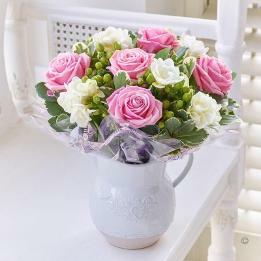 This glorious hand tied is wonderfully feminine and exudes a sense of timeless elegance and beauty. We love the array of textures plus the shades of soft pink, fresh white and cool lilac, each adding something new to admire. An irresistible gift. Imagine how please they'll be when they discover your gift contains wine, flowers and chocolates. 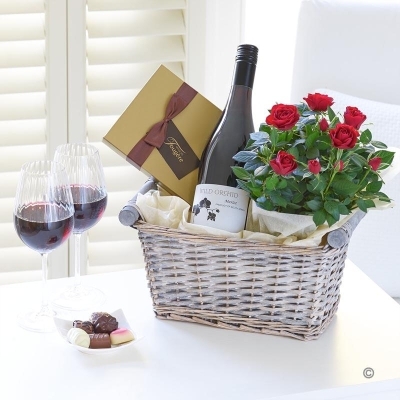 We've chosen richly flavoured red wine, a box of premium quality Maison Fougere luxury chocolates and a stunning flowering rose plant. 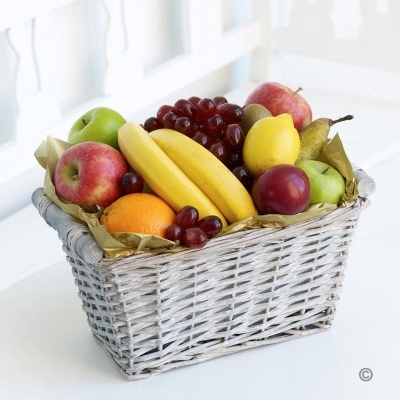 It's all presented in a pretty wicker basket to create a gift that is sure to delight. Also available with white wine and rose wine.